APO, Siliguri Recruitment 2017. Interested/ qualified applicants can submit for Tradesman Mate jobs within 21 days from the notification published in Employment News. Application forms for the current recruitment available at Indian Army official website www.indianarmy.nic.in. Download the notification from the official website and read the detailed instructions to fill the application clearly. Send the application with required documents to 27 Mtn Div ORD Unit, C/o 99 APO, Sevoke Road, Siliguri before last date. Other details related to Number of posts, Eligibility Criteria, Selection pattern, Age Limits, exam procedure, Application procedure details of 27 Mtn Div ORD UNIT, Siliguri Tradesman Mate Jobs recruitment 2017 are mentioned below. Last date to reach application form through offline: 21 days from the date of publication in the Employment News. Total vacancies available in Indian Army 27 Mtn ORD Siliguri Recruitment are 25 posts. Post Name: Tradesman Mate: 25 posts. Pay scale for Tradesman Mate Jobs is Rs. 18,000/- plus other allowances admissible as per rules. Candidate must have Qualified 10th class or equivalent from any recognized board and should have knowledge in Hindi. Age limit for general candidates is 18 years to 25 years. For OBC candidates is 18 years to 28 years. 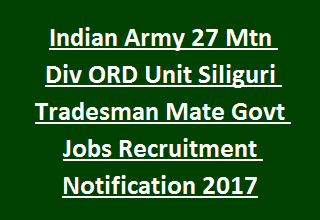 Selection of candidates applying for Tradesman Mate Jobs in Indian Army 27 Mtn Div ORD, Siliguri Recruitment will be based on following stages. -Male: Carry 50 Kgs of Weight to a distance of 200 Mtrs in 100 Sec. -Female: 25 Kgs to a distance of 150 Mtrs in 100 Sec. Written Test consists of 200 questions, each question carries one mark and the time duration is 2 hours 20 Minutes. Syllabus: Syllabus for this test is per Matriculation Standards only. a. General intelligence and reasoning: 50 Questions- 50 marks. Interested candidates have to apply for this Tradesman Mate Jobs using the official website www.indianarmy.nic.in. Detailed instructions available at Indian Army official website. Download the notification and fill the application form clearly. Last date for submitting application is 21 days from the date of publication in the employment news.